The first snow has fallen this auction season. Alpine landscapes and skaters on a frozen canal are among some of the highlights of Shapiro Auctions’ October sale. Alfons Walde (Austria 1891-1958) Bauernsonntag. Estimate: $200,000-300,000. 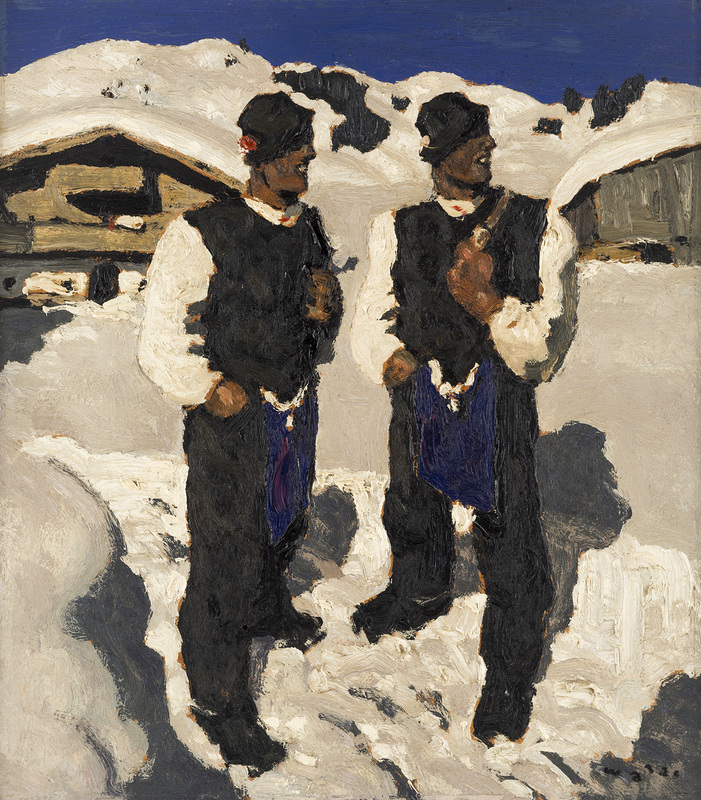 The oil painting Bauernsonntag is a perfect example of Walde’s work, where the Alpine landscape serves as beautiful scenery surrounding a pair of nearly identical robust men from the mountain village. Both the ultramarine sky as well as the snow and figures are fundamentally Waldean in their formal simplicity, with the boxy figures and limited color palette resulting in a dynamic, high contrast image. Another landscape painter with a weakness for glittering winter scenes is the German artist Johannes Bartholomaus Duntze. The Alps, Norwegian landscapes, and winter scenes from Holland form the main motifs of the 19th-century painter. The colorful and friendly imagery, in the style of the Romantics with only a thin application of paint, is clearly demonstrated in Winter Scene with Skaters on a Frozen Canal from 1870. With the emphasis on lighting effects, with backlight as preference, as viewers, we can almost feel the crisp air in this winter scenery. 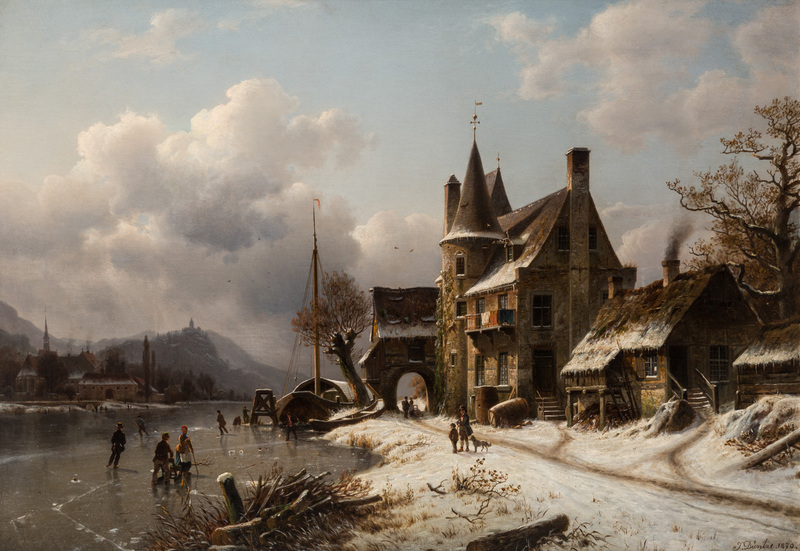 Both Bauernsonntag and Winter Scene with Skaters on a Frozen Canal will be up for sale at Shapiro Auctions on October 6 at 10am EDT. The Fine & Decorative Art Auction includes European, American, Asian, and Russian Works of Fine Art & Antiques.